Bed ladder straps (or bed rope ladders) are looped around the frame or leg of a bed and help debilitated individuals rise up to sitting positions, or safely lower themselves prone in their beds, without the use of their hips or legs (Source). They are also useful for re-positioning their sleeping postures from one side to the other. They are frequently employed as alternatives to 'overhead monkey bars' to help patients to sit up in bed. 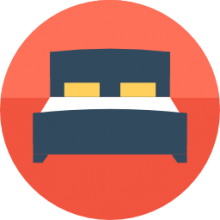 Many users say that it's actually easier to pull from the foot of the bed than from overhead to rise up or lower into their mattresses (Source). To use them, all you or a loved one needs to do to sit up is pull on the loops. The loops frequently have three different handles, designed to accommodate users of different stature (Source). If you or your loved one can't get a grip on the bed rope ladders, they can experiment with slipping their forearms or wrists through the ladder rungs and see if they can lift themselves. Though, we have spoken to some buyers who were too weak to actually pull themselves up using their bed ladders. However, most were able to use these pull up straps effectively. *Click here to check out the Safety Sure Bed Pull-Up Strap. One buyer we spoke with told us that they purchased this BedCaddie support ladder at the behest of a physical therapist to help them achieve a sitting position in bed without the help of their home care provider. This reviewer said that it was easy to attach to the bed frame. They also advised to make sure that what you attach the bed rope ladder to give it a few strong tugs prior to using so that you're sure that it is secure enough to hold the weight of a person clambering up or down the BedCaddie. The pull-up ladder is adjustable, enabling you to customize its length from 48" to 84"
Let's take a look at 5 of the best-selling bed pull-up straps on the market today and see how they compare. This bed support offered by Standers is well-made, safe, flexible and practical for anyone who needs help sitting up. Users love that the strap is adjustable, but some do note that there is a strong rubber smell present. This bed support pull up measures 1 x 7 x 9 inches, and it has three 5-inch hand grips that are soft and durable, a strap made of nylon, and you can adjust the length from 48 inches to 84 inches. You don’t need any tools to install the bed support, and it’s suitable for any bed frame. The weight capacity is 300 lbs. A customer comments that she had this bed trapeze strap permanently attach to the underside of her platform bed and that her husband can get out of bed safely. Another happy buyer shares that he didn’t think that the pull up strap would withstand his weight of 250 lbs, but it turned out he was wrong. The reviewer also adds that he uses the sit up support regularly and he has not a single complaint. A satisfied purchaser mentions that the bed assist strap was very handy after his abdominal surgery and that he recommends it. However, some customers have complained that this bed strap requires too much upper body strength and that they find it hard to use. Some users also state that it doesn’t stay in one place and that it’s too flimsy. This bed pull-up strap offered by Skil-Care is sturdy, well-design and easy to attach to the bed. Users love that it’s light and strong, but some do note that there are no instructions for proper attachment. This bed support is 85 long, and it’s made from cotton webbing. It’s latex free, and the recommended weight capacity is 200 lbs. The ladder-type design makes it useful for pulling yourself to a comfortable sitting position in bed. Overall, this could be the perfect solution for anyone that has a hard time lifting himself up from the bed. A buyer comments that his 86-years-old mother uses the Skil pull-up strap regularly and that she can get up without a struggle. The reviewer also mentions that the bed support is well-made, but he would have preferred if it was longer. Another happy customer shares that she has muscular dystrophy and that she finds the bed strap useful. Thanks to it, she can roll from her side to her back with ease. The reviewer also adds that she highly recommends it to those who have sufficient upper strength. A happy user states that the bed rope ladder is light, and it doesn’t bother him at all. However, some customers have complained that they are disappointed with the performance of the bed pull strap and that they find it hard to use. One user also complains that the handles are not soft enough and that they hurt her hands. If you are looking for a well-made bed strap, you might take a look at the Kinsman rope ladder. Users love the design and the price, but some do note that it might be hard to use. This bed assisting ladder is made of heavy-duty cotton webbing. It has easy-to-grip ladder rungs to help you pull yourself up, and you can loop your arms through the four loops which are spaced 10 inches apart. The extra long webbing attaches to the bed frame or the leg. It weighs only 3.7 oz so that it won’t bother you at all. Moreover, the Kinsman pull-up strap is machine washable. But be aware that due to hygienic purposes, you might not be able to return the product. In general, users have a high opinion of the Kinsman bed pull-up strap, and they praise its design and functionality. A buyer comments that this bed trapeze works fantastically for him and that the highly recommends it. The reviewer also states that the bed ladder is easy to use and that the loops are very helpful for getting out of bed. Another user mentions that the pull-up strap doesn’t get in his way and that he feels confident enough to use it. However, some do note that it requires a certain amount of upper strength. This bed pull-up strap offered by Medca is easy to attach, safe, well-made and suitable for all bed frames. Users love the sturdy construction, but some do note that it’s not as helpful as they expected. This bed strap has a ladder-like design to make it easier for you to sit up and it’s made of durable nylon. You can attach to your bed frame without any tools. It has three cushioned rubber hand grips which are slip-resistant, and you can adjust the length to fit your preference. The recommended weight capacity is 300 lbs. A buyer comments that his 90-years-old mother used this bed rope ladder regularly during rehab and that she could pull herself up with little effort. Another reviewer states that he would recommend this pull-up strap to anyone who is bedridden and that it’s simple to attach it to the bed. A user adds that he is very impressed with the quality of the rope ladder and that it withstands his 200 pounds without tearing. The purchaser also mentions that his mother liked this strap so much that he bought a second one. However, some customers have complained that the bed rope ladder gets tangled often and that they find it difficult to attach it tightly to the bottom of a hospital bed with wheels. Some also point that it requires too much upper strength to use. This bed support strap offered by AliMed is versatile, well-made and suitable for people that lack the strength to pull themselves up. Users love the practicality of the strap, but some do note that it’s overpriced for them. The AliMed bed pull-up is made of cotton webbing, and it has a series of loops, which are spaced 10 inches apart. You can securely attach it to the bed frame or the bed leg, and it’s extremely light – only 4.8 ounces so that you won’t feel it. The pull-up strap is also washable. In general, users are pleased with the functionality and practicality of the AliMed bed assisting strap. A buyer comments that the bed rope ladder works wonderfully for him and that he can sit up in bed without requiring additional assistance. He highly recommends it to anyone looking for a reliable pull-up strap. Another purchaser mentions that he was skeptical of the usefulness of this bed trapeze, but it turned out to be a handy tool to have around. However, some customers have noted that even though the material is strong and durable, the stitching is done poorly. A reviewer complains that the strap unstitched after a couple of days of use and that he doesn’t recommend it. One of the first bed pull up devices we examined was the Stander Bed Caddie. 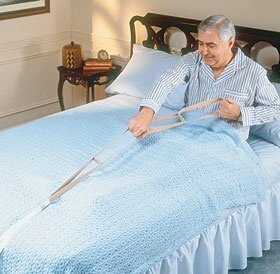 This particular bed support assist handle includes three different hand grips and an adjustable nine nylon strap to help you or a loved one sit up easily in bed. It has a weight capacity of 300 pounds, is adjustable from 48 inches to 84 inches and can attach to any standard bed frame. The manufacturers say that its ladder design and ergonomic handgrips make it easy to pull themselves up in bed, and is often used in conjunction with bedside fall safety mats and bed safety rails. The way it works, all you need to do is wrap the strap around the underside of the bed frame, use the clasp to lock it in place, and then adjust the length so that it best fits your needs. 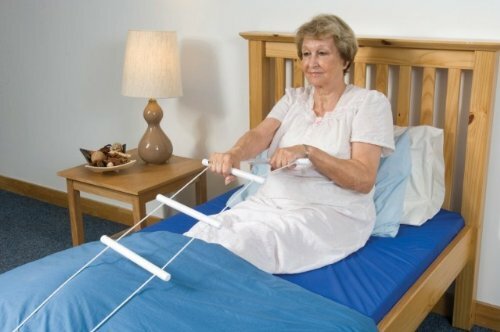 While most users were pretty satisfied with this bed pull-up strap, one buyer did say that for the elderly or the disabled who suffer from weakness in the upper body, they may not be able to actively pull themselves up using this method. Another buyer who stands at over 6 feet tall and weighs over 250 pounds, has used this bed pull up strap as he clambers into bed and re-positions himself to get into a comfortable sleeping posture. A paraplegic we spoke with told us that it is it a strongly constructed bed pull up ladder, enabling her to adjust herself into a seated bedtime position, plus it's adjustable length made it a snap to modify to her particular stature. The second bed pull up assistance device we looked at is manufactured by Skil-Care. This particular option has a weight capacity of 200 pounds, three different handles, and is 85 inches long. One buyer who suffers from a degenerative muscular condition says that it has been central to his getting a decent nights sleep- enabling him to roll from one side to the other and onto his back as well. Some buyers also purchased leg lifters for the disabled- these were helpful in adjusting immobile limbs. Another option we examined was the bed rope ladder by MEDca. The manufacturers say that its ladder-style design makes it simple for its users to climb up into seated positions while they are in bed, or even lower themselves down into a prone position or a nights rest. Like all of the others we have examined, it provides a tool-free assembly, merely attaching to the bed frame itself. One buyer we spoke with said that they were using it after they suffered a fractured pelvis, which resulted in a lengthy rehabilitation process that included significant back pain issues. Happily, she found it that this bed pull up ladder was an effective way to deal with her mobility issues adjusting herself in bed. Some buyers even describe considering purchasing an expensive hospital bed for their loved ones recuperating at home from surgery but instead decided to outfit a regular bed with safety rails and one of these in bed pull up assistance devices. 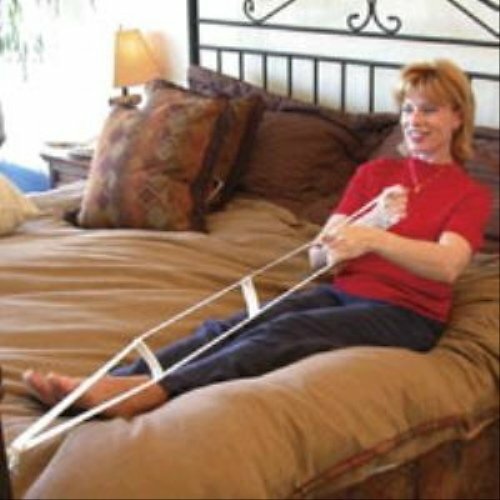 As with other bed pull up devices we examined, some buyers did say that if you lack strong upper body strength, it will be a challenge using one of these bedroom assistance devices to hoist yourself into a seated position. Another buyer also installed bath steps for the disabled- another helpful way to outfit the home to accommodate the elderly and disabled. The last option we looked at was the AliMed bed pull up which, like other options, it has three different ladder-style rungs to grab onto and will securely attach to a bad leg or bed frame.